Much like their namesake, the Grand Tetons (meaning large teat in French) have seduced adventurous men for centuries. Men like David E. Jackson. Legend has it that Jackson, a beaver trapper, spent so much time in the valley surrounded by the Grand Tetons, which his fellow trappers referred to as a "hole," that it became known as Jackson's Hole. Others would soon find respite there as well. The abundance of fertile land lured ranchers and cowboys, while the geological diversity and abundance of wildlife lured conservationists who would eventually turn the Grand Tetons into a national park. Snow bums made it their sanctuary starting roughly around 1939, the year Snow King Resort, next to Jackson Hole, became Wyoming's first ski area. In the 75 years that have followed, the city and slopes have embraced modernity but without sacrificing the area's small-town Western charm. And so, on the same day visitors can ride one of the world's most advanced ski lifts and drink a better cocktail than found in most major cities, they can also eat trout at a greasy spoon and order a beer while straddling a horse-saddle barstool. 7:45 A.M. The only reason to get out of bed this early, besides the lure of fresh powder, is the huevos rancheros at Nora's Fish Creek Inn. The 15-foot wooden trout signage that adorns the log-cabin roadhouse might not scream prestige, but the Inn won a James Beard American Classic Award in 2012. For just $8.50 the massive plate of green chili salsa-drenched huevos should provide plenty of fuel for the slopes, but it couldn't hurt to throw in a couple of fluffy blueberry pancakes as well. 8:52 A.M. Get in line right as the lifts open at 9. Jackson just replaced its ancient Casper triple chair lift with a $5 million high-speed quad, which travels at 1,000-feet-per-minute and takes riders to the top in only 3 1/2 minutes. The Casper mid-mountain region is best for intermediate skiers—the reason why there was such a big push for quicker access. The Jackson Hole Mountain Resort also widened many of the trails to accommodate higher traffic. But don't worry about not having enough challenging runs at the resort—about half of the trails are expert level. 12:18 P.M. Take a 15-minute ride on the tram up to Rendezvous Mountain, and stop by Corbet's Cabin for lunch. The no-frills shack, which also serves as a ski-patrol base, sits at 10,450 feet above sea level and provides a 360-degree view of the Tetons. Devour some waffles with Nutella and wash them down with a cold Pabst Blue Ribbon. After all, energy and liquid courage are required to even think about skiing Corbet's Couloir. Starting off with a mandatory 20-foot free fall, it's one of the most terrifying (and exhilarating) slopes in the country. If you survive, take it down to Expert Chutes, then to Toilet Bowl, then Gros Ventre to the base. It's the best way to get in four runs and feel like you conquered the mountain. 1:42 P.M. Before leaving the Teton Village base, stop by Wool & Whiskey. The wool is primarily brought to you by rugged men's clothing brands like Pendleton, Filson and Billy Reid; the small batch bourbon is courtesy of Wyoming Whiskey, distilled four and a half hours east in Kirby. This hooch hits hard with sweet caramel and a hint of pecans, with an apple and wood finish. 2:58 P.M. Jackson Hole, of course, is replete with natural wonders. The National Elk Refuge—a 25,000-acre span of meadows and marshes where around 10,000 elk migrate to during the winter—sits just to the northeast. Buy tickets at the Jackson Hole and Greater Wyoming Visitor's Center for the horse-drawn sleigh tour. Some areas are so dense with elk you can nearly reach out of the red wooden cart and touch two at once. But with about 45 mammals and 175 bird species in the region, it's also easy to spot other wildlife, namely bison, wolves, bighorn sheep and eagles. 4:29 P.M. Another natural wonder (more or less) adorns Jackson Hole's town square—a quartet of giant arches built out of elk antlers. (Rest easy animal-rights activists, they're not from slain elk; the animal sheds its antlers each fall.) Pass through them on the way to the nearly 30 art galleries within a couple blocks of the square, spanning from folky to modern to what-the-hell. At minimum, step into RARE, which has art by the likes of Andy Warhol and Ansel Adams. At the quaint Valley Bookstore find a new read for the flight home, most likely in the staff-recommended section. 6:06 P.M. With Jeff Drew, a three-time James Beard Award nominee, in the kitchen, you're in good hands at the Snake River Grill. The restaurant, located on the town square, serves fare that adds a touch of refinement to rustic Western cuisine. With white linens, a stacked-stone fireplace and illuminated log posts, the restaurant's interior echoes the kitchen's ambitions, providing the comfortable atmosphere of a sophisticated ski lodge. To start, order an appetizer of steak tartare pizza; to properly conclude the meal, go with the 16-ounce dry aged buffalo cowboy steak. And don't worry: There's no shame in not finishing it. 9:18 P.M. Saddle up (literally) on one of the saddle barstools at The Million Dollar Cowboy Bar. 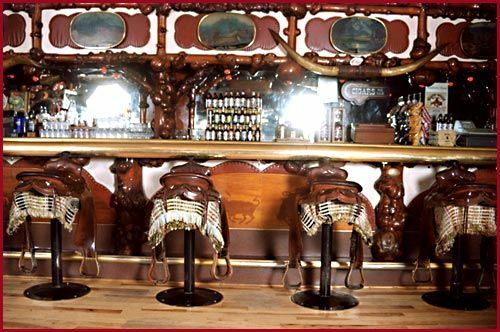 The famous saloon has a storied history that dates back to 1937. Shortly thereafter, the bar earned the first post-Prohibition liquor license in Wyoming. While the then-modestly named Cowboy Bar attracted more cowboys than tourists, today there are still plenty of ranch hands and boot-wearing locals scuffing up the pine floors with their two-step moves. It's tempting to order a rye straight in order to feel like a cowboy. But don't do it. You're not fooling anyone. 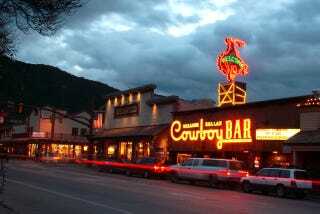 Instead, ask for their own Million Dollar Cowboy Bar Beer, a golden ale brewed locally by the Grand Teton Brewing Company. 10:22 P.M. Leave the cowpokes behind and head to The Rose. Located in the newly renovated Pink Garter Theatre, the bar was opened in 2012 by David Kaplan, a Jackson Hole native, renowned bartender and owner of New York's Death & Co. The decor is somewhat bougie (chandeliers and velvet Victorian wallpaper), but the ambiance is comfortable and unpretentious. Order the Spy Hunter: Connemara Irish whiskey, lime, yellow chartreuse, Berg & Hauck's celery bitters and mint. Then decide if you want to catch the end of the indie show playing in the theater. Don't stay out too late, though. The slopes open at 9 A.M. again tomorrow. Read all the entries in the Never Sleep series here. Jennings Brown is an associate editor at Popular Mechanics magazine. His work has appeared in Esquire, Cowboys & Indians, Cigar Aficionado, and CNN Travel. Follow him on Twitter at @tjenningsbrown.